For years and years and years I've wanted to join a CSA (community supported agriculture), so when I read about Fresh Fork Market in Cleveland Magazine earlier this spring, and noticed that they offer meat, vegetarian, and vegan options for around $20 a week, I was sold. 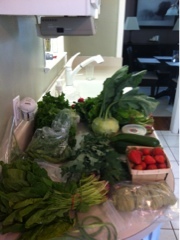 I can spend $20 on 3 things at Whole Foods, so why not play vegetable roulette and see what $20 can get you locally. If you're not familiar with the CSA concept (I wasn't) basically you "subscribe" to a service to get a grab bag of whatever is fresh from local farms weekly. Last week I got strawberries, zucchini, kohlrabi, radishes, kale, collard greens, lettuce, Ohio City pasta, garlic scapes, spinach, peas, and feta cheese. Admittedly, I'm on;y familiar with about half of the things that I got, so I've been doing a lot of google-ing to try and figure out how I can make the most of what I got without wasting a lot of it. Prepare pasta following directions on the box. Set aside. 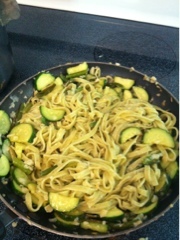 Put garlic olive oil (or regular - both would work), garlic, garlic scapes, zucchini, and a little bit of water in a pan. Heat on medium/medium-high heat. (be careful to not overcook the garlic) Cook until zucchini is thoroughly cooked but not mushy. Add water if necessary to prevent anything from burning into the pan. Ad salt as needed. Add cooked pasta to vegetable medley. Sprinkle with Parmesan cheese (optional), season with lemon juice to taste (original recipe calls for one lemon but I was using juice out of a jar), stir, and serve. I was really happy with how this recipe turned out. The fresh Ohio City pasta added a nice touch to this dish, too. (even though I added too much of it!) But I'm sure boxed pasta would work just as well. I didn't know if lemon and zucchini would work well together, but they did. My litmus test for recipes like this is my meat-a-tarian boyfriend, and he even enjoyed it. I would definitely make this recipe again if I had similar ingredients and needed to whip up something in a hurry. From cutting board to plate this took less than 30 minutes to make. Tonight's adventure in using CSA ingredients is going to be a shitake and pea pasta...let's hope that turns out as well as this dish did!